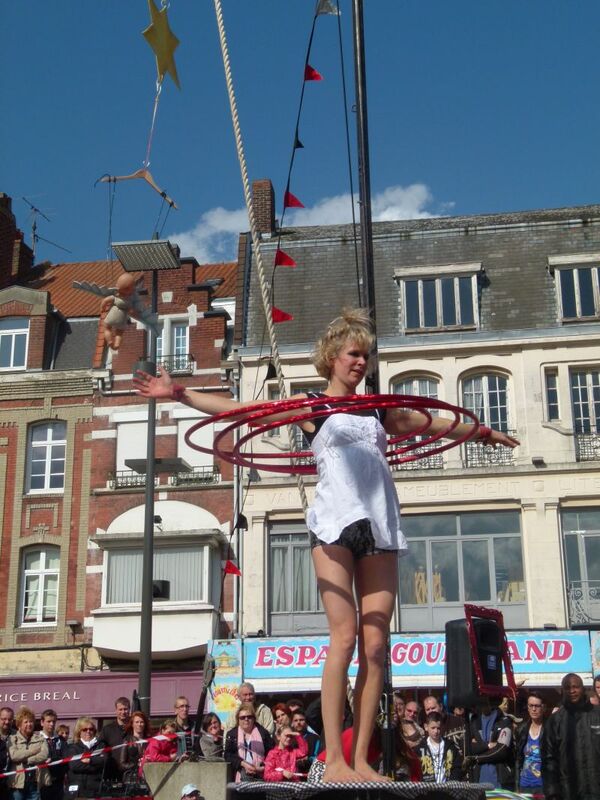 accueil site > Reportages > Z’Arts Up et Z’Ailleurs 2012 > Death or Circus ? That is the question ! 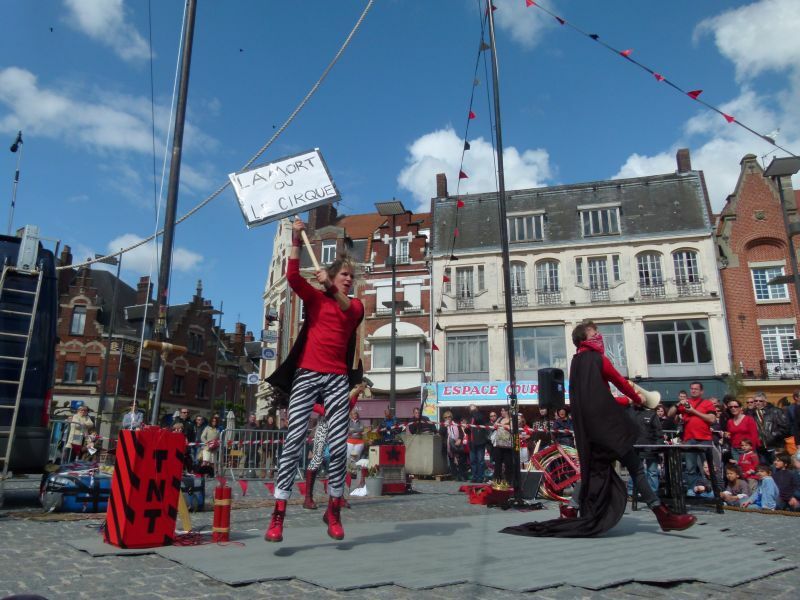 On Saturday 12th May, the audience, young and old, gathered on the Grand Place of Béthune to see the premiere of Death or Circus, the last creation of the circus crazy company Tumble circus. 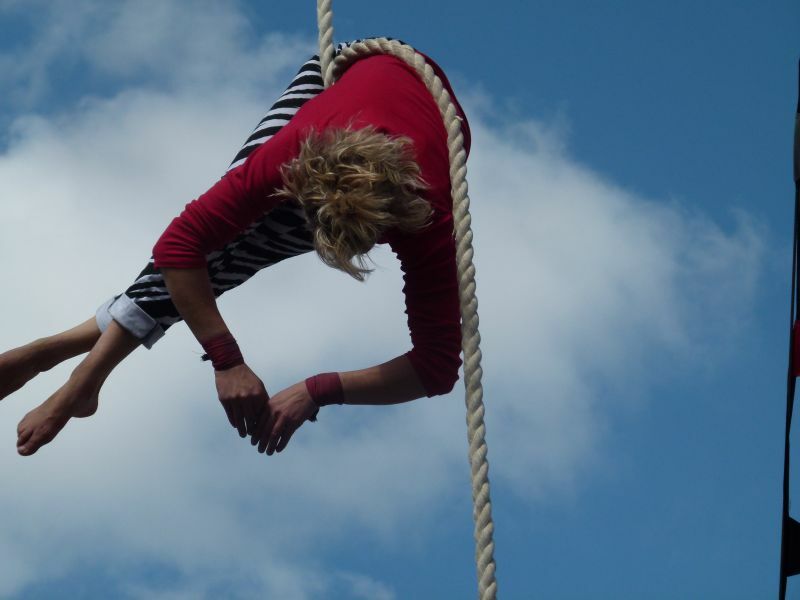 Coming straight from Ireland, Tina Machina and Ken Evil have performed during one hour, acrobatics and juggling act combining circus, clowning, satire and slapstick. 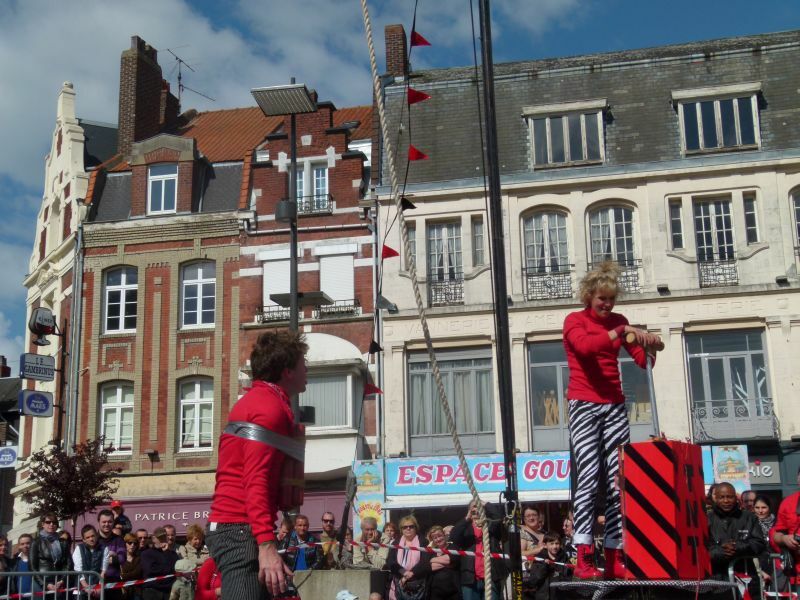 The show starts with a sensational arrival of the two performers who speak to the crowd, standing on the roof of their van to ask the following question : Death or Circus ? 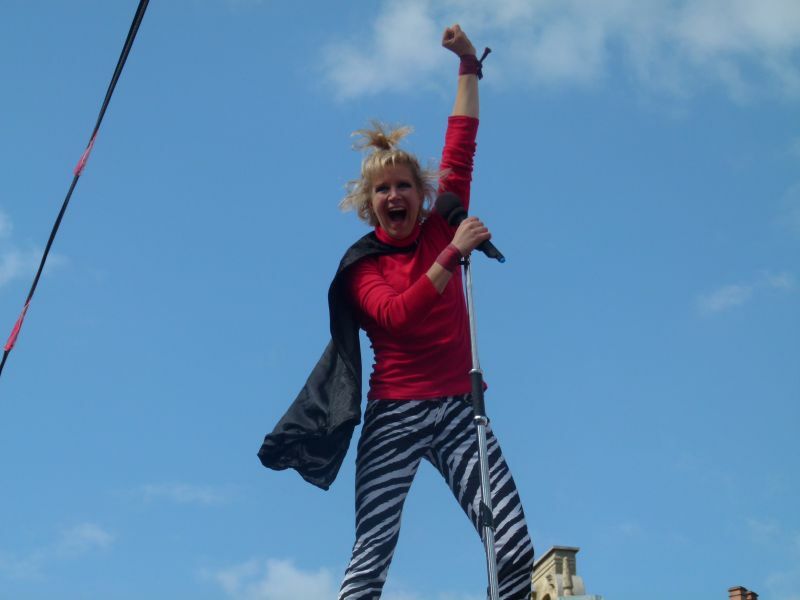 Then starts a fabulous trapeze act performed by Tina on a song wrote by John Lennon, tribute to women, Woman. But very soon, a love rivalry sets up between the two characters, a third woman arrives. 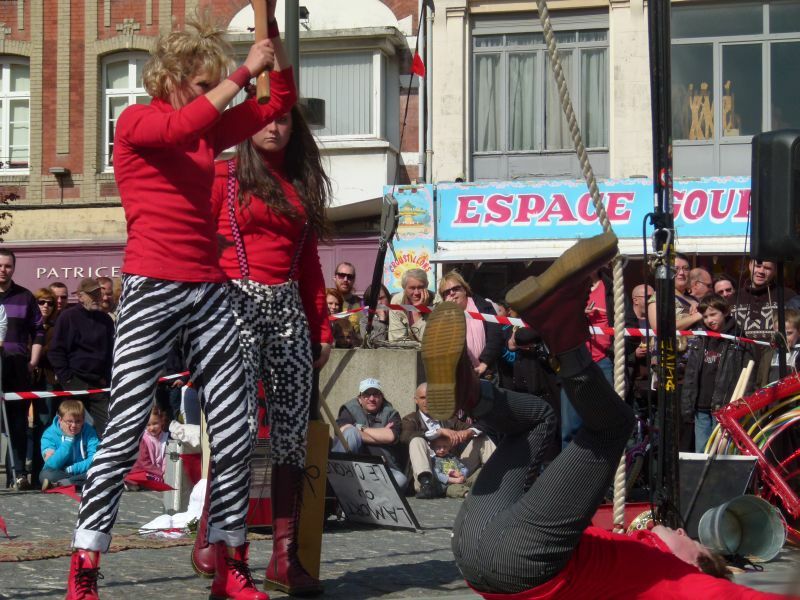 To take revenge for an infidelity, the women start a real ‘lynching’ of Ken, who in spite of having taken pain killers, cries at each blow dealt by the women. Everything is used : slaps, hammer, racket and giant spanner ! The women decide to kill the infidel man with a giant explosion ! In spite of the obvious approval of the audience, Ken refuses to be executed. Someone has to die ? But who ? They look toward a little girl in the audience and kindly invite her to hold the explosives. Then, they press on the detonator but the mechanism suddenly exposes, knocking them to the ground ! The show starts again : Tina sings the famous song if the Irish rock band U2 ‘still haven’t found’, they engage the children of the audience : ‘What do you parents do for living ?’, ‘Prof…’, ‘teacher’, ‘Year Head’ !